Happy Friday and Happy Thanksgiving! I hope you were able to enjoy your Thanksgiving Day and took time to reflect on the blessings that are all too frequently easy to overlook. Q: Why do you get if you divide the circumference of a pumpkin by its diameter? This entry was posted in Friday Funny, Humor and tagged Thanksgiving on November 22, 2018 by Leonard. Happy Friday! It is now less than a week to Thanksgiving and I imagine your Thanksgiving plans are well underway. The anticipation of sharing a great meal with family is often mixed with anxiety about preparing the “perfect meal” for everyone. One of the biggest culinary concerns is often the turkey. Well, fear not, Butterball operates a Turkey Hotline every year during the holiday season to help you cook that perfect Thanksgiving bird. Of course they do receive some rather interesting questions from time to time. Here are some of my favorites. need advice on how to get the metal bits out of the turkey. The turkey in my freezer is 23 years old. Is it safe to eat? Does the turkey go in the oven feet first or head first? How long does it take to thaw a fresh turkey? Can I thaw a frozen turkey in the aquarium with my tropical fish? How do I roast my turkey so it gets golden brown tan lines — in the shape of a turkey bikini? handle the 7,000 to 8,000 calls the talk line will receive that day. Just in case, the number is 1- 800-Butterball (1-800-288-8372). This entry was posted in Friday Funny, Humor and tagged Thanksgiving on November 16, 2017 by Leonard. I hope you were able to enjoy Thanksgiving Day. In 1863 Abraham Lincoln proclaimed the last Thursday of November as a national day of Thanksgiving in the midst of the Civil War. Since 1939, the fourth Thursday in November has been designated as that goes far beyond parades, football and holiday shopping deals. Of course, we realize that the roots of Thanksgiving goes mush further back. From our earliest days in grade school we associated Thanksgiving with the Pilgrims and their 1621 feast which lasted three days and consisted of fish, shellfish, fowl, venison, berried, fruit, vegetables, grains, beans, corn and squash. Even in the midst of hardship those that had survived a difficult first year in the new world were thankful for what they had. Much more recently, in 1973, we were provided a new perspective on this day with the arrival of “A Charlie Brown Thanksgiving.” If you remember, Peppermint Patty calls and invites herself and her friends Marcie and Franklin over to “Chuck’s” house for a holiday dinner. With the help of Linus and Snoopy, Charlie Brown makes quick preparations. As the guests arrive they all directed to the backyard ping-pong table where their feast awaits. Linus leads the group in prayer, and Snoopy serves up the food, throwing the plates to each guest Frisbee-style. Each person receives two slices of buttered toast, pretzel sticks, a handful of popcorn, and some jelly beans. The guests think this odd at first, but they decide in the end they are thankful for what they have. In the midst of all the frantic activity of this long weekend, can we pause for at least a moment to ponder at least one thing we are thankful for? This week, this day, take a few moments and reflect on what those Pilgrims went though, on what Abraham Lincoln called the country to,yes even what Charlie Brown reminded us of – take more than a moment to be Thankful for all the goods things. This entry was posted in Friday Funny, Humor and tagged Thanksgiving on November 24, 2016 by Leonard. Happy Thanksgiving! Today we are reminded of the Pilgrims and their three-day feast which was observed in the midst of hardship as those who survived their first year in the new world took time to be thankful for what they had. I imagine at least once you have watched “A Charlie Brown Thanksgiving.” You can probably recite the story where Peppermint Patty calls and invites herself and Marcie and Franklin over to “Chuck’s” house for a holiday dinner. With the help of Linus and Snoopy quick preparations are made. The guests arrive and they all make their way to the ping-pong table in the backyard for the feast. Linus leads the group in prayer, and Snoopy serves up the food, throwing the plates to each guest Frisbee-style. Everyone receives two slices of buttered toast, pretzel sticks, a handful of popcorn, and some jelly beans. The guests think this odd at first, but they decide in the end they are thankful for what they have. Today we use ovens and microwaves to quickly and efficiently prepare turkey, stuffing, mashed potatoes with gravy, sweet potatoes, corn, vegetables, pumpkin and pecan pie. We buy all these at the grocery at the last-minute and wonder how we will survive the few hours the grocery is closed on Thanksgiving Day. There is a morning’s worth of parades followed by an afternoon and evening of football. Then comes “Black Friday” as we lose all thankfulness and all civility in an effort to wrestle those door-buster specials away from anyone who dares to get in our way. Saturday brings a bunch of college football rivalry games including Ohio State and some school up north. 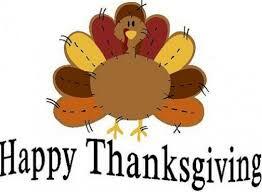 In the midst of all this frantic activity we pause to take moment to state one thing we are thankful for? This time, let’s take more than a moment, let’s reflect on what those Pilgrims went though, what Charlie Brown reminded us of. Yes, there are many problems in this world, yes some days are difficult and some days are next to impossible, still there is much to be thankful for. So, stop and ponder, be thankful for all of the good things in your life this Thanksgiving Day. Turkeys will be thawing overnight and into the morning, transitioning to warming in the oven to an afternoon high near 190 degrees. As the day progresses, the kitchen will become hot and humid, and if you bother the cook, be ready for a severe squall or cold shoulder. Towards late afternoon, the cold front of a knife will quickly slice through the turkey, causing an accumulation of one to two inches on most plates with higher accumulations on some. Mashed potatoes will drift across one side gravy may lead to localized flooding and watch out for cranberry sauce to create some slippery spots. As we look toward the evening, a weight watch and indigestion warning have been issued for the entire area, with increased stuffiness around the beltway. As the evening comes on, the turkey will diminish and taper off to leftovers, dropping to a low of 34 degrees in the refrigerator. Looking ahead to Friday and Saturday, high pressure to eat sandwiches will be established. Also expect occasional flurries of leftovers both days with a 50 percent chance of scattered soup each day. We expect a warming trend where soup develops. By early next week, eating pressure will be low as the only wish left will be the bone. This entry was posted in Humor and tagged Thanksgiving on November 26, 2014 by Leonard.